Full Support for the etag and vary HTTP headers. 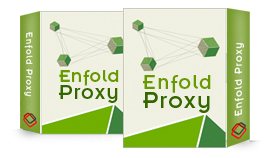 64 bit versions of Enfold Proxy (EP) now support XDV/XSLT Caching. EP now supports "split view" caching. This allows EP to use different caching methods for different parts of the same page. This can be helpful in caching components of a web page for logged in users. Works with Plone 3 and 4 and with plone.app.caching add-on. The ordering of the proxy definitions in the ep.ini file no longer affects how or whether EP will process them. You can optionally use excludes_regex for more fine-grained control over which proxy definition acts upon a particular URL. EP will not store requests which were initially found to be invalid. Added an option in the EP configuration tool to disable one or more proxy definitions temporarily. More support for XDV theming. Added a way to select a theme by not meeting a certain rule (more). Added documentation for developers about more complex configurations of XDV themes. That includes: Selecting a theme based on URLs and/or HTTP headers. Added the absolute prefix field to XDV definitions. This field allows EP to rewrite relative URLs. Added options which will specify actions to take in response to 500 messages. Added ability to provide policy over how load balancing schedulers route requests. Implemented XDV theming. For more information, see the XDV tutorial. When a remote host closed its connection, Enfold Proxy now correctly detects a prematurely closed socket. Do not use rewrite feature of IIS 7 site if Enfold Proxy is being used on the site.